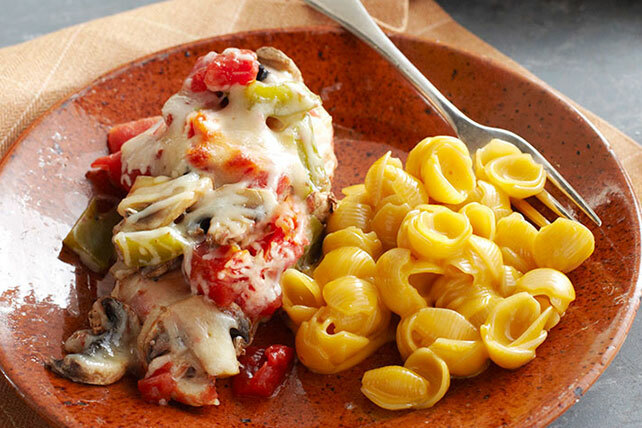 Melted cheese over veggie-laden chicken is a standout on its own. Pair it with creamy shells and cheese for a tasty combo that even your pickiest eater will enjoy. Place chicken in 13x9 inch baking dish; surround with mushrooms and peppers. Top chicken with tomatoes and shredded cheese. Bake 30 min. or until chicken is done (165°F). Meanwhile, prepare Dinner as directed on package. Serve chicken and vegetables with Dinner. Save 50 calories and 7 g fat per serving by preparing with KRAFT 2% Milk Shredded Italian* Three Cheese Blend and VELVEETA Shells & Cheese Dinner Made With 2% Milk Cheese. For added flavor, sprinkle chicken with 1/4 cup chopped fresh basil just before serving. Substitute 1-1/2 cups small fresh broccoli florets for the chopped green peppers.